Hey, Good Morning my friends!! Today, we are living Internet lives. Web has become an integral part of our lives and we can’t think of even a day without our favourite lappy, internet and our daily dose of fav websites. Most of us are so comfortable with online shopping that we just don’t feel the need to go into that hot or cold weather outside and simply enjoy shopping in the comfort of our home. Recently, I found a very beautiful kurta (shirt) at a store and the discount on that was only 10%. I came back home and browsed same brand over internet and got that easily at a whopping discount of 40% on jabong.com.Great na!! I extensively do my shopping from Jabong, Myntra, Snapdeal as they have authentic products and they offer great deals too. 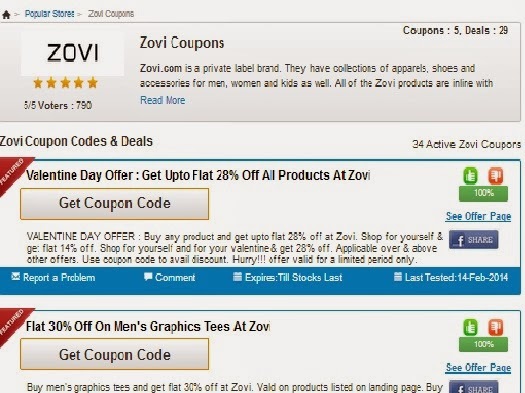 Now coming to deals part, there are many websites these days that offer coupons and deals to be used on famous websites. 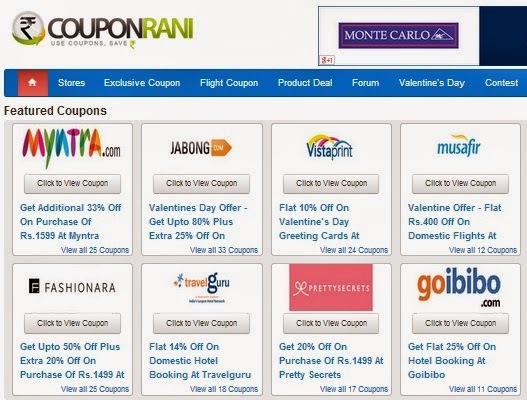 One such portal that I like very much is couponrani.com. Couponrani.comis a website that has collaboration with many great websites and thus gives coupons and deals for all such websites. 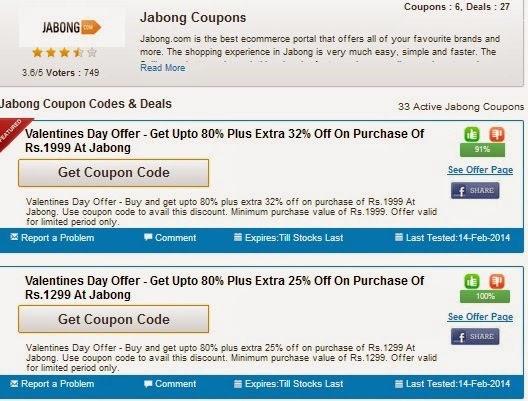 Since, we are already doing shopping from websites, isn’t it great that we can get some extra discount on products so that we get our favourite products without making our pockets much lighter!! You can easily get the coupons and deals without subscribing to them but it is always better to subscribe as then, you won’t miss any deal!! 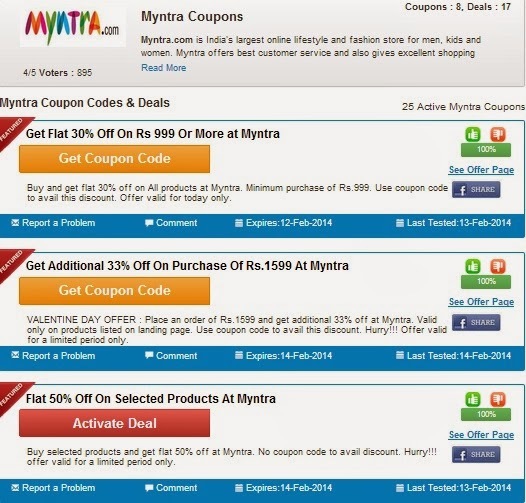 They have a Chrome Extension too that makes the coupons available to us without leaving the website that we are shopping on. The good part is that they have ‘Live Chat’option too. Great coupons and deals on offer always. Coupons from lots of retailers and all famous websites. Live Chat option available, if you have a query. So, to summarize, I love what couponrani.com offers. You just have to click and activate the deals and copy the code onto your final purchase page on the website you are shopping. Why not save money when we can, easily, in a single click. Couponrani.com requested me to do the review but the opinion is totally mine and the review is unbiased!! great post, love it! lovely design! would you like to follow each other via gfc? Yes, you're right. I totally prefer shopping online for almost everything 🙂 It's so easy and convenient nowadays. Such a nice review Charu! never tried this….want to try this once! Hey Doll, Thanks for you comment on my post. I am now following You on GFC, Twitter, facebook & bloglovin. ich kaufe auch sehr viel online, auch wenn ich versuche, auch in den Geschäften hier bei uns vor Ort zu shoppen. Genauso wie Du freue ich mich dann immer sehr, wenn ich Gutscheine finde, die meinen Einkauf günstiger mache. Ich muss jetzt dann gleich testen, ob diese Page die Du hier vorstellst, auch für deutsche Online-Shops funktioniert. Hoffentlich war Dein Wochenende bisher wunderbar und Du hast es mit Deiner Familie genossen!